Nigeria’s earnings from oil production and sales in the 27 months Pres. Buhari has been in office is far less than what the previous government led by ex-president GEJ earned in one year, Daily Sun is reporting. Since the Buhari government came to power, oil price has been in the all-time low, to the extent that a barrel of oil once sold for $27. Previous oil price peaked at $120 per barrel once, during the GEJ’s government. 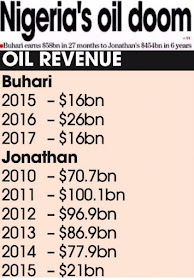 According to figures from OPEC on Nigeria’s oil earnings since 2010 till date, the Buhari government has raked in $58 billion since coming to office. The statistics showed that the Jonathan government earned a total of $453.5 billion between 2010 and 2015. Meanwhile, the Buhari government has received kudos from the European Union (EU) and the United States government over its prudence in managing scarce resources. According to EU officials, the Buhari government has shown responsibility in managing funds, in the face of low revenue. “The EU is impressed that the Nigerian government has been afloat despite the drop in oil earning. From what we gathered, the government has been meeting its obligations. This is commendable,” an official said. When reminded that the FG had borrowed to finance the budget, he said: “There is no problem about borrowing, as long as the money is used for the stated purpose. We have seen this in Nigeria under the current government. This is good development." On the part of the U.S, the country’s official said the Nigerian government had shown fiscal responsibility. According to a top US official, for a government that is not earning much money to be running shows the ingenuity in economic management. The US officials said if the Buhari government could keep afloat in economic distress, it means it would do more for the country if the economic were buoyant.